Vision, Not Just Critique • How Should We Measure Housing Affordability? • After Paying for Housing, How Much is Enough for Basic Necessities? • Affordability: The 30 Percent Standard’s Blinders • In Defense of the 30 Percent of Income to Housing Affordability • Housing Need Is Even More Skewed by Income Than We Thought • The 30 Percent Rent-to-Income Ratio Doesn’t Add Up in NYC • The Secret History of Area Median Income • When Deep-Income Targeting Doesn’t Hit the Mark • How to Build a Case for Community Development and Affordable Housing • Will Limited-Equity Cooperatives Make a Comeback? 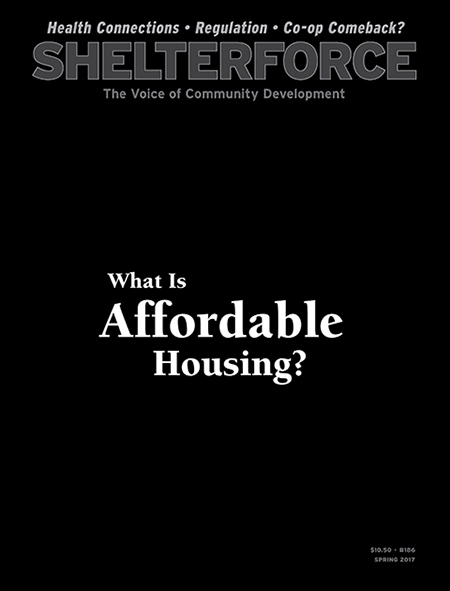 • Regulation and Housing Supply: Where the Left & Right Agree (Sort Of) • Thoughts on the Unnatural Occurrence of Cheap Housing • Creating a Sanctuary For Youth in Camden, New Jersey • A Look at a Medical, Legal Aid Partnership in New Orleans • How the Bay Area Got $2 Billion for Affordable Homes • Q: What Do All These Housing Affordability Terms Mean?